For over a year I've been planning to check out Spice Brick Oven Kitchen and recently I finally made it there. It was one the way home so we pulled in to check on gluten-free options. The dinner crowd had not arrived yet so there were only a few tables in the place and they had a printed gluten-free menu at the hostess desk. We decided to give it a try since they weren't busy and we were very hungry. In studying the limited gluten-free menu, I was little taken aback. This restaurant is a tapas place (of sorts) and I've always found more options at tapas places than I could possibly order during one meal. That was not the case at Spice Brick Oven Kitchen...in fact, we would have left and gone elsewhere had we not been SO hungry. To start, we shared the hummus served with veggies (as the gluten-free option) and I ordered grilled scallops assuming that dish, listed for $11.50, would be plenty of food for my meal. It wasn't. The scallops were delicious and perfectly prepared. They were fairly small and the amount of food on the plate was small - even for a tapas place. My husband enjoyed his shockingly large individual gluten pizza and even took some of it home! When the bill arrived, we found out it was 1/2 price pizza night so the pizza was only $7! If you can eat regular pizza, it's definitely worth checking out. If you can't, you might want to consider going elsewhere for diner. 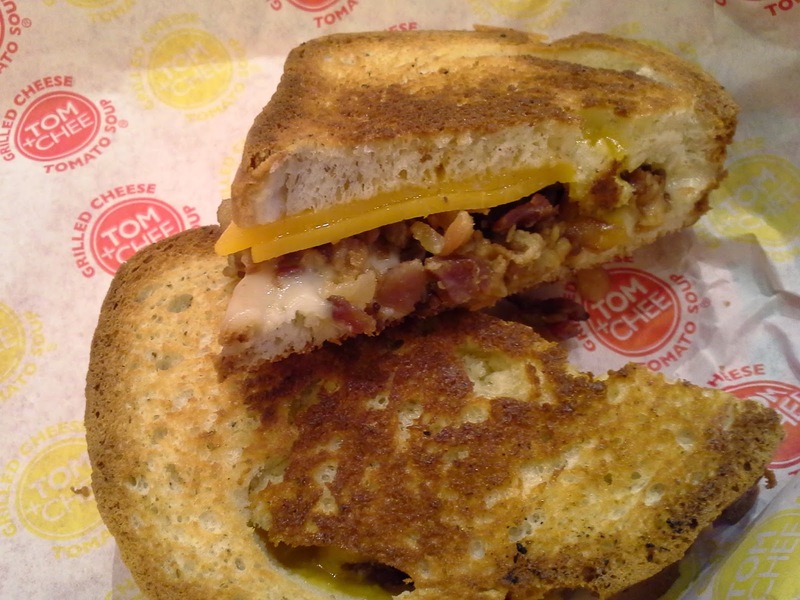 Tom + Chee = gluten-free happiness! When I saw the Tom + Chee guys on Shark Tank many months ago, I thought to myself that I should find out if they offer gluten-free sandwiches and if so, if they had a location here in the ATL. Then I basically forgot about it until my friend, Dionne, told me there was a Tom + Chee location near me and they had gluten-free bread. As someone who grew up eating grilled sandwiches weekly (even ordering them when dining out as a picky-eater child!) I was uber excited to check out the options at Tom + Chee! Since so many places offer gluten-free bread these days without bothering to train their staff on proper gluten-free food prep, I called Tom + Chee to get the low down on their gluten-free service. They had all the right answers so we headed there for lunch on a rainy Friday. The place was packed out at 12:15 and we stood in line for about 20 minutes to order at the front counter. We had plenty of time to check out the menu during that time, at least. We each got a grilled cheese sandwich - mine on gluten-free bread - and we shared a small salad. We didn't try the soup, but plan to on another visit. The verdict? The sandwich was delicious and the salad was fresh! You get two different cheeses of your choice and I added bacon as well. The menu online states that some cheeses are not gluten-free and I've not called the company to ask why those cheeses are not considered gluten-free. In any case, the cheeses I had (cheddar and mozzarella) and the bacon were very good quality. The bread was fine, if a little dry, but I find that at many places that offer gluten-free breads or buns these days. Gluten-free sandwiches are prepared using a separate grill, knife and gluten-free bread. Children's meals ($3.95) come with grilled cheese, soup and drink, but soup may be swapped for fruit or chips. There are currently two locations (one in Alpharetta and one in Kennesaw) open in the north Metro area and one more (in Buford) is coming soon. If you enjoy grilled cheese sandwiches - please Enjoy! The first sign I saw about an Earthfare location opening up was in Forsythe county and that store is not only not open - it's not currently listed as "coming soon" on the company's website. However, the good news is that the Peachtree Corners location in Norcross is open and it is absolutely fabulous! While I wasn't overly impressed with the prices or selection of the produce in the store, the meat and seafood was pretty reasonable - grand opening specials not withstanding. And the packaged items labeled gluten-free were everywhere we looked. It was actually overwhelming to see product after product that I've not seen anywhere else in the ATL or in some cases, never even heard of! Over the last couple of years, I've discovered that I need to choose my carbs carefully which means I don't indulge much in the tasty gluten-free bagels, waffles or buns on the market today. I have a few boxes of the killer Pillsbury gluten-free muffins in the freezer right now and I've only enjoyed one muffin. If I could stand the carb overload, I could eat two of those treats a day - at least! Those should be available at some Ingle's stores now and are coming soon to local Kroger stores - very exciting! These light, fluffy muffins are great to pack in school lunches, enjoy as afternoon snacks or travel with. The individual wrapping keeps the muffins fresh until you're ready to enjoy them. OK - back to Earthfare. For the shopper looking for the latest and greatest gluten-free products available in the Atlanta area, Earthfare is the place to check out. Other locations are on tap to open later this year (one on Cheshire Bridge Road maybe one near the Collection at Forsythe as well as other locals the company has signed leases for). 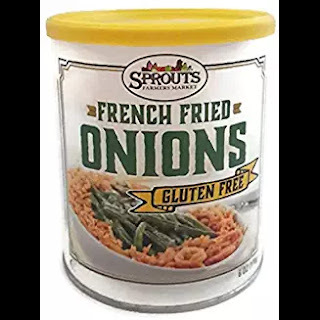 The absolute best part about the Earthfare stores is that they are not too big for their britches like some other stores in the area are. If you place a request for an item made by a company the store already brings something in from, it's likely you'll see it on the shelf (or in the freezer) during your next shopping trip. Yes - they make things happen quickly and Earthfare. No worrying about requesting gluten-free ice cream cones this summer only to wait to see them in the store next summer. That is not the Earthfare way - they are serious about getting things done and done right!